Should our children work in our family company when they are adolescents? Is it better that they work in our company or in another company where they won’t be classified as the owners’ kids? If they come to work for our family company, how should they be treated as employees? Advisors and educators typically answer these important questions by citing ample anecdotal evidence that basically says that work experience during adolescence for family members is very useful. Working in one’s family company provides a sense of the family’s business and the family’s responsibility to it. It can also help an adolescent understand if they like the work of the family and at least give them a sense of a work environment. Working in other companies can also be developmentally useful and perhaps more so; it can help the adolescent learn what it means to be a lower ranked employee where one is not the boss’s child, and can build work discipline plus empathy with non-family employees. Authors Houshmand, Seidel, and Ma, in their well-designed research, have explored a different and very useful topic concerning adolescents who work in their family’s company: How does such work experience affect an adolescent’s relationship with his or her parents, and how does it affect his or her psychological well-being? I have never heard a parent ask about these effects on an adolescent, but any good parent would want to know what the authors discovered. Using longitudinal survey data from Statistics Canada on Children and Youth, the authors studied the temporary (e.g. summer) and year-long employment of adolescents from business families who worked in their family’s company. They also compared these results with adolescents from non-business families who worked in companies owned by others. But for practical purposes related to business families, we will focus on the findings of the business family analyses. The first important finding is that adolescents who worked in their family’s business experienced improved relationships with both their parents, not just when they were working in the family business but also one or two years later. (That finding should motivate any parent, and perhaps most adolescents.) Adolescents that work for their family firm throughout the year reported having an even better relationship with their parents, compared with those that work for the family company during only part of the year. 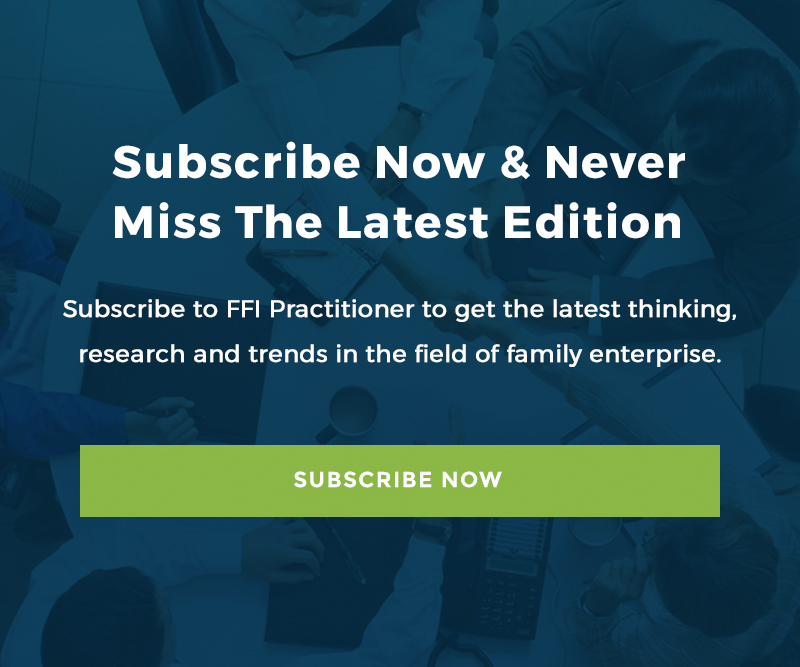 The authors believe this positive association could be because parents in these family business work situations demonstrate more interest in their child’s development. This may also result from adolescents gaining a deeper understanding of the financial situation of their families and, through their involvement, directly contributing to it. Second, the authors measured the effect of adolescents working their family’s business on their psychological well-being, namely the incidence of depression, and the adolescent’s self-esteem. In general working in the family firm seems to reduce the incidence of depression and increase the self-esteem of the adolescent, regardless if the work period is year-long or for part of the year. The reasons for this improvement in well-being are not well articulated by the authors but I expect that closeness with one’s parents, a feeling of contributing to the family, growing in capability, among other reasons could explain this result. This interesting research strengthens and complements other observations and advice advocating employing adolescents in one’s family business. I think this is one of the most hopeful and useful articles I have found to share with parents in business families. Many parents today worry that offering employment in the family business to one’s adolescent child can put too much pressure on the adolescent and steer him or her too much to work in the company when they become adults. The default in many business families is to be neutral about employment opportunities; let the adolescent decide. I and other advisors don’t advocate pressuring an adolescent or adult relative to work in the family business. There can be many good reasons to advocate for an adolescent to work in a business other than the family company. But this article has given parents in business families two good reasons why employing an adolescent child in the family business may be good for the child and the family. John Davis, FFI Fellow, is founder and chairman of Cambridge Family Enterprise Group. He joined the Harvard Business School (HBS) faculty in 1996, and has taught and chaired executive programs, custom management programs, and MBA courses. Since the 1970s, he has served as an academic, advisor, author and speaker in the family enterprise field and he is recognized as one of America’s leading wealth advisors. John is the 2016 recipient of the Richard Beckhard Practice Award and can be reached at [email protected].